The Streetlight Management Plan (SMP) focuses on researching new streetlight technology, investigating ways to enhance the appearance of our streetscapes, updating lighting standards and improving outage reporting. The SMP will also guide County staff on the selection of future streetlight technology, optimization of maintenance, and general service delivery needs. The SMP Community Advisory Panel will provide a forum for key stakeholders to advise County staff on safety, sustainability (energy savings, health, environmental impacts), technology and streetscape priorities. The planning process began in the fall of 2015, and has consisted of collecting data and conducting research and analysis. This includes: assessing the County’s current streetlight inventory and operations; partnerships with other agencies (such as Dominion Virginia Power); and best practices among similar jurisdictions. For general information on streetlights in Arlington, visit our streetlights website. View a map of the commercial and residential streetlight locations. Streetlights for the demonstration have been removed and the original streetlights have been re-installed. In May 2018, Arlington County hosted two field demonstration tours to: educate the community about the streetlight management plan; provide an overview of the technology and different products under consideration; and to listen to community feedback. Over 60 residents registered for the tours. An additional field demonstration was held with surrounding jurisdictions and partners. 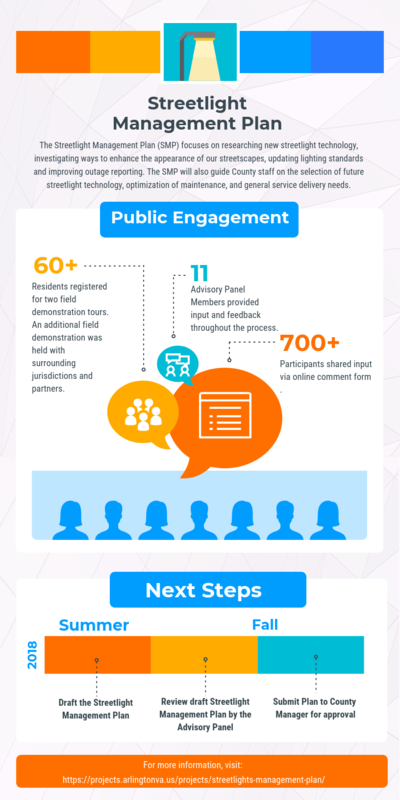 Over 700 participants shared input via the County’s online comment form. 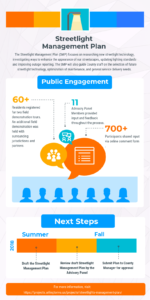 A summary of the public feedback will be available online later this summer. The streetlights will also be evaluated from a technical standard. This, along with the public feedback, will inform our streetlight management plan.